Pac-man is a game where you navigate a small yellow circle around a maze, collecting dots and fruit whilst avoiding brightly-coloured monsters, or ghosts. As long as there was at least one 'man left, the game would play forever. Why would such a dramatic glitch occur? LD A,(#4E13): Load the level number (at memory address 0x4E13) into A.
CP #08: Is A < 8? JP NC,#2C2E: If not, jump to large-number fruit handling code. LD DE,#3B08: Load the address of the cherry into DE. CP #08: Is 0 less than 8? Yes. The fruit-drawing loop will then proceed to draw a fruit, subtract from the counter, check if it's equal to 0... but subtracting anything from 0 will cause it to underflow to 255. And 255 is not equal to 0. The loop will dutifully draw fruit on the screen repeatedly until it has finished, by which time it will have drawn "level number + 1" fruit, which is fine when the level number is less than eight, but not when it is 255. This attempt to draw 256 fruit on the screen, overwriting many other items - such as the precious Pac-dots required to complete the level - whilst doing so, is the cause of this dramatic glitch. 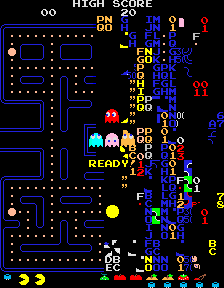 No matter what the player does, the "Pac-dots collected" count will never be large enough, so the game cannot progress and ends here. This is why the kill-screen glitch occurs, and the final level of Pac-man will always be impossible to complete.